Sublime Skies, LLC DBA Insight Observatory is pleased to announce a joint Education Outreach collaboration with SkyPi Online Observatory, LLC! SkyPi Remote Observatory was conceived as an installation of automated roll-off observatories with telescope piers with the purpose of hosting remote imaging telescopes by John and Jan Evelan of Mesa, Arizona back in 2012. 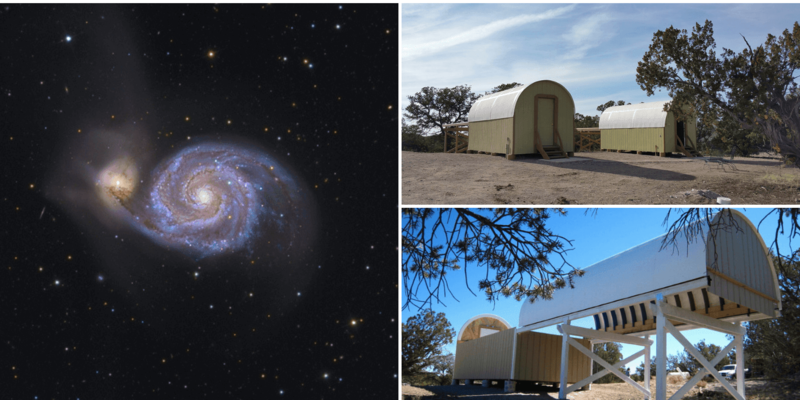 "The facility is dedicated to providing a superb remote imaging environment for the discriminating astrophotographer" as stated by John Evelan. "The remote observatory site is located in Pie Town, New Mexico with a population approximately of 200. It is arguably among the darkest sky sites in the lower 48 states. There are many other advantages that come along with this site. As I began planning the observatory, I realized that sharing and hosting the site was a natural evolution for it. The goal is to make remote observing accessible and more affordable to the astronomy community." 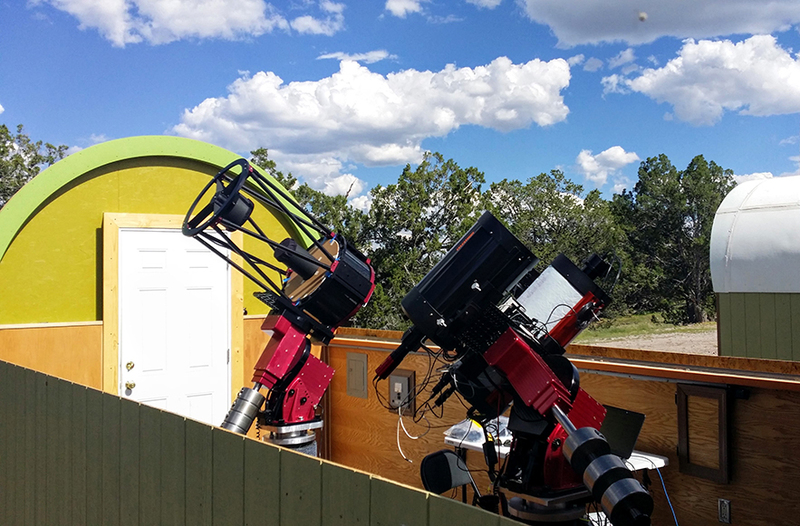 Remote Robotic Telescopes hosted in SkyPi Remote Observatory's Alpha Observatory. Image courtesy of SkyPi Remote Observatory. 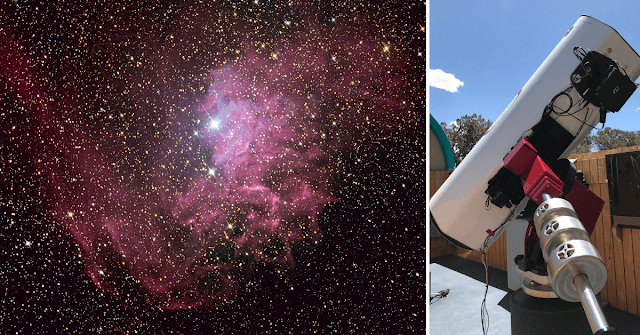 The comments above are exactly why the founding members of Insight Observatory, Michael Petrasko, and Muir Evenden chose the location for hosting their 16" f/3.7 Dreamscope Astrograph imaging telescope that was installed in May 2017. After carefully searching for the ideal location to host their Astronomical Telescopes for Educational Outreach (ATEO-1), they chose SkyPi Remote Observatory. Not only did the physical location turn out to be phenomenal for imaging and research but the service provided by John and his talented technicians, Michael and Caleb went completely above and beyond what their expectations were during and after the installation of the telescope. Their response time to any technical issues and special requests is extremely prompt. Insight Observatory could not imagine hosting their remote robotic telescope anywhere else. hosted at SkyPi Remote Observatory. As their business relationship flourished and Michael Petrasko was onsite this past May on a routine telescope maintenance visit, John and he were discussing the online ATEO Portal Muir had designed and developed for accessing the ATEO-1 remote telescope via the internet. John asked if "any" telescope could be accessed via the online portal and when Michael replied yes, John opened up one of SkyPi's roll-off observatories that houses a Williams Optics 5" f/7 with a one-shot CCD camera attached. John then continued, "Even this one?". That's when SkyPi's 5" f/7 refractor became Insight Observatory's very first affiliate imaging telescope on its network and has been designated ATEO-2. Currently, the crew at SkyPi are in the midst of configuring an 11" f/10 Schmidt-Cassegrain telescope that will be dedicated to planetary imaging. This imaging system will be known as ATEO-3. M51 - The "Whirlpool Galaxy" imaged by Bob Birket on his Optics 12-inch RCOS Astrograph hosted at SkyPi Remote Observatory. Automated Roll-Off Roof Observatories Alpha, Bravo, and Gamma to the right. John and Jan Evelan share the same passion for educational outreach the founding members of Insight Observatory do. After ATEO-2 was configured by the crew of SkyPi to be accessed by Insight Observatory, it became accessible on Insight Observatory's Educational Image Request (EIR) Form for classroom projects. ATEO-2 can also be accessed on their Public Image Request (PIR) Form as well. The telescope will be added to the online ATEO Portal within the next couple of months. 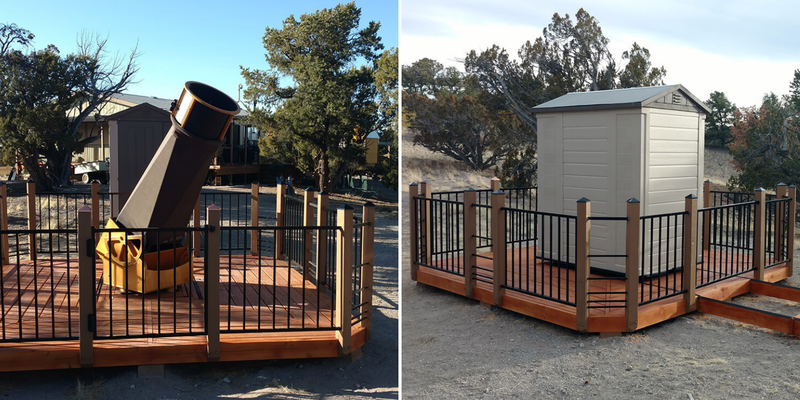 An Observatory housing n 18" Dobsonian Telescope was constructed so clients could enjoy observing in the dark skies at SkyPi. The telescope will also be used for Education Outreach events as well. Images courtesy of SkyPi Remote Observatory. Both companies met on a video conference call this past Labor Day weekend to discuss possible joint ventures where both entities may accomplish their common goals for education outreach. Insight Observatory could not be more enthusiastic to partner up with SkyPi Remote Observatory on these! If you are looking for the ideal spot to host your imaging system, we strongly recommend SkyPi. Other Astro-imagers have found SkyPi Remote Observatory to be the ultimate hosting solution other than Insight Observatory. You may read all of their positive feedback on their Testimonials page on their website. Also, check out the images taken by SkyPi's hosting clients on their image gallery.